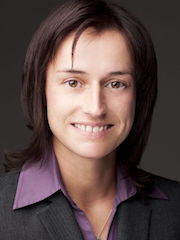 Judith Sippel is principal investigator in the International Research Training Group "StRATEGy" and senior scientist in the Basin Modeling section at GFZ Potsdam. Her research focuses on the lithosphere-scale structure and thermal field of sedimentary basins as a basis for investigating their tectonic evolution and georesource potentials. She develops three-dimensional (3D) subsurface models by integrating diverse types of observations such as gravity, seismic, and borehole data. Her interest is in developing best practice for the assessment of the present-day configuration of the sedimentary cover, crust and mantle in terms of rock physical properties. Such data-driven 3D basin models allow her to perform 3D numerical simulations of physical processes such as for heat transport, infer spatial variations in key characteristics such as mechanical strength, and reconstruct basin history.